So our house has three bedrooms, but one of them is very very small. It's an odd shaped room, and has an open door up to the ~finished attic. It's not big enough to put our guest bed in any of the corners, so we chose to use the other larger bedroom as our guest room, and this room as my office and keeper of my clothes. CR keeps his clothes in our bedroom, and the attic will eventually become his space (once we actually finish the walls and replace the carpet). So let's talk about the most fun part, about where my clothes go! I mentioned before that our house does not have huge closets, being that our house was built in the 50's. I don't have a TON of clothes, but I have a fair amount, so this one bar was just not going to cut it for my closet. In addition to my closet, I recently purchased this dresser from Amazon after searching all over the place for a white dresser. I fell in love with this one because it's so darn practical! 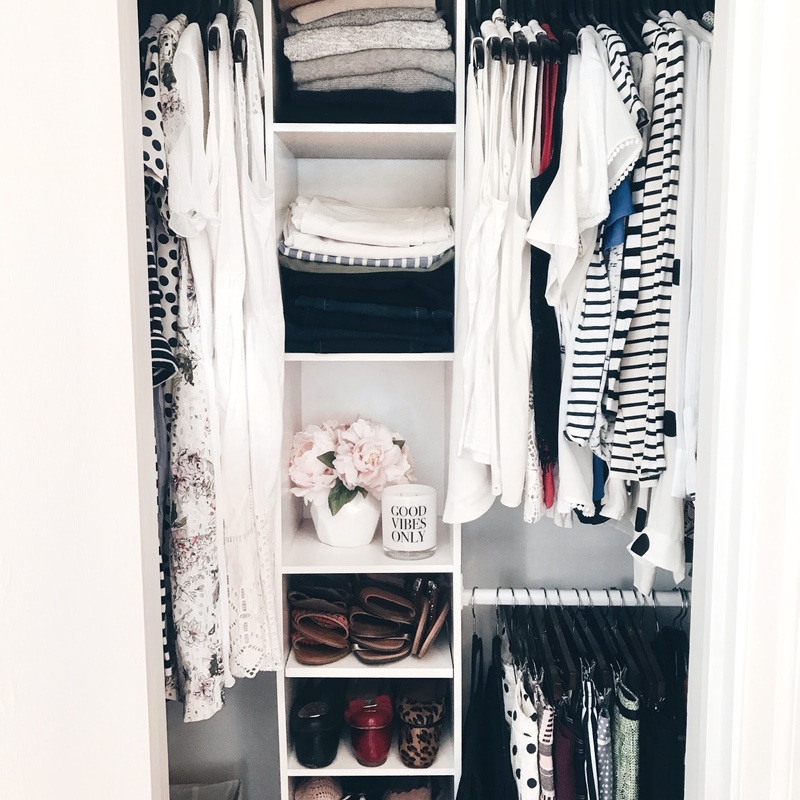 It has drawers for all my under garments and work out clothes, but then the right side I keep all my make-up and hair accessories - I love that I can just close the door and it just makes the room look so much tidier! Best part is that the dresser is actual wood, so I feel like I finally own at least one "real" piece of furniture. If you're interested in it, keep an eye on the price as it's been fluctuating over the past month - I got it for $200 less than it's listed for right now! So the dresser goes along the right wall in the above picture, and then I bought this gold bookcase (also from Amazon) for the wall on the left side of the picture. I spent a long time trying not to buy that bookcase because it's a bit of a blogger cliche to have a gold open bookcase (at least I feel everyone has one!) but it was really difficult to find something that was open enough to fit in that space without blocking out a part of the room (because you basically walk right into that went you enter the room). Eventually I caved though and bought the gold bookcase (here's a similar Ikea hack if you want to save a bit of money). I am obsessed with it! I just love how pretty it is, how it holds my jewelry box, my most special purses, my perfume, and all my other accessories. It's just the stand out piece in this tiny room! Above is what that space looked like before we painted everything (and before we added my mini chandelier!). My desk goes in the left corner, as you can see in the diagram above. I was thinking about putting a rug down under the desk, but the more I think about it, I feel that may look a bit weird and also be impractical with my office chair constantly rolling over it. I may end up adding a lighter pink one in the middle of the room (something like this rug from Wayfair) - what do you guys think? So that wraps up the house planning tour (see the downstairs here and our bedroom post here). While all the painting is finally done, it'll be a while until our rooms are ready to really be shown off, so hopefully we will resume the house posts in a few months! Thank you for all of your help in this process - we really appreciate all of the helpful tips and encouragement you guys have sent our way!